Located in the heart of Sorrento, the Cathedral dates back to the X-XII centuries, when it was transferred inside the urban surrounding wall. The Sorrento Cathedral is dedicated to the Saints Phillip and James and it is said to be risen on the ruins of an ancient Temple dedicated to Jupiter. 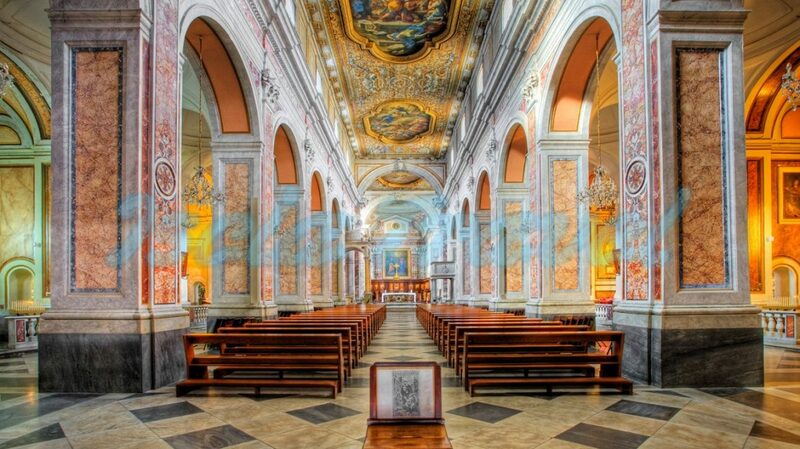 Noteworthy is also the new tholobate situated to the entry, completely inlaid with representation of events of the history of the Sorrento church, from the St. Peter arrival in Sorrento till the Pious IX visit in 1849. Entirely painted on cloth is the central ceiling, made by Francesco Francareccio, in marble is the Episcopal desk, pernickety combination of rests of the Roman temples and of the sixteenth-century. The pulpit of the church shows a bas-relief that proposes the Jesus Baptism while in the Chapel of the Sacrament there is a wooden Crucifix of the fifteenth century positioned on a polychrome marble altar of the end of the seventeenth century. In the last chapel on the left is kept an important nativity scene of the Neapolitan tradition of the eighteenth century. The main façade of the Church has been reconstructed in the 1924. More information about "The Cathedral of Sorrento"?